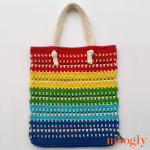 It's a Day at the Beach Bag - Free #Crochet Pattern on Moogly! Whether it’s the beach, the pool, the waterpark, or the local park, the Day at the Beach Bag is ready! With it’s generous size and wide straps it’s super practical, and the nautical striping and details make it a great way to show off your style – and crochet skills! 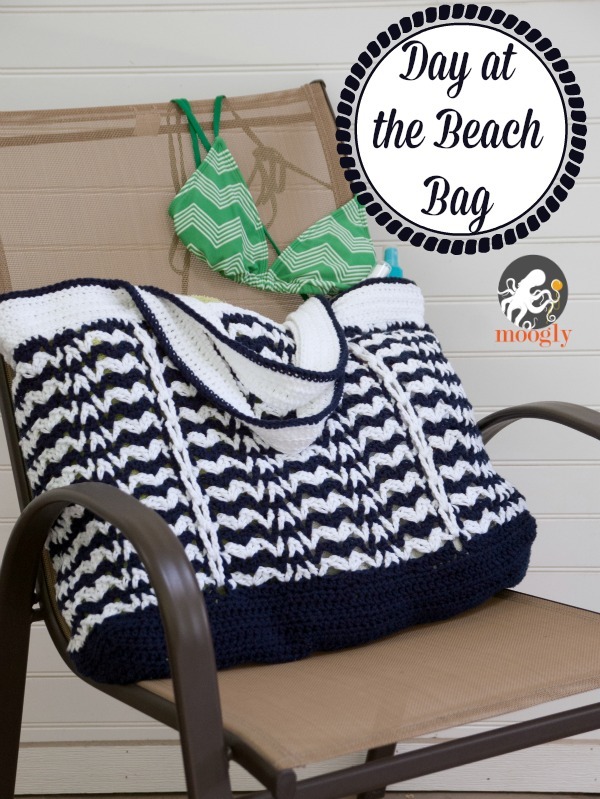 The Day at the Beach Bag was weeks in the designing – but it’ll be a lot quicker to crochet! And I think it was totally worth it. 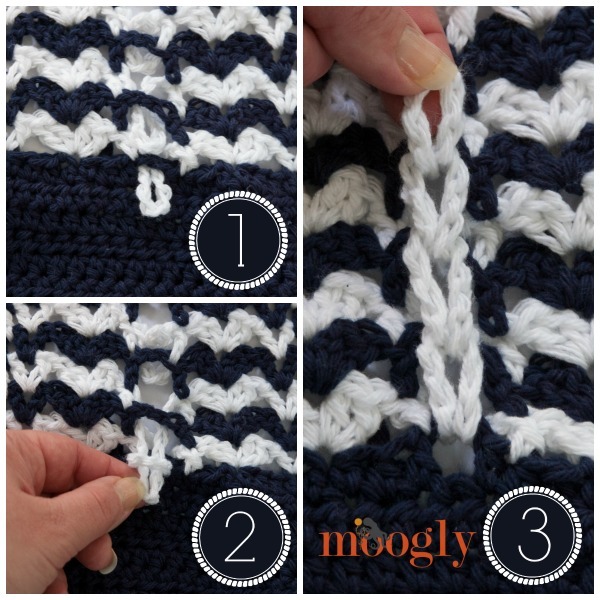 I love all the little details, from the four”ropes” that run up to the handles, to the surface crochet on the handles themselves, to the stripe stitch pattern – borrowed from the Vintage Wobble Afghan! 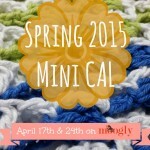 Every way you look at it, this bag is full of interest – for both the crocheter and the user! Click here to add this pattern to your Ravelry Queue and Favorites! This is an intermediate difficulty pattern – please be sure to read all the notes and watch the linked tutorials as needed! I prefer to start a row of hdc with a ch 1 and an hdc in the first st. If you prefer to ch 2 then feel free to substitute. 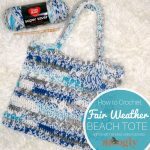 If you prefer not to break the yarn after each stripe, you can carry them along inside the bag – however this may result in some color showing through. The first 15 rows are worked in rows, then starting with Round 16 you’ll be working in rounds – see the Bag Bottom Tutorial linked above. When working in the round, you’ll often join and turn (turning it wrong side out, as in the Pampering Massage Soap Saver Tutorial if desired). So you’re still working in the round, but heading in opposite directions, as if in rows. This keeps the stitch pattern from leaning in one direction. Be careful not to work an extra stitch in the sl st join. Round 19: With Color B, join with a sl st to the st left of a ch-2 sp that is on the left, as you look at the RS of the bag (see diagram above). Ch 3 (as dc), *skip 2 sts, [(2 dc, ch 1, 2 dc) in next st, skip 3 sts, (dc, ch 1, dc) in next st, dc2tog over 3 sts (skipping center st), (dc, ch 1, dc) in next st, skip 3 sts] 3 times, (2 dc, ch 1, 2 dc) in the next st, skip 2 sts, dc in the next st, ch 12, skip ch-2 sp, dc in the next st, skip 2 sts, [(2 dc, ch 1, 2 dc) in next st, skip 3 sts, (dc, ch 1, dc) in next st, dc2tog over 3 sts (skipping center st), (dc, ch 1, dc) in next st, skip 3 sts] twice, (2 dc, ch 1, 2 dc) in the next st, skip 2 sts, dc in the next st, ch 12, skip ch-2 sp, dc in the next st; repeat from *, omitting last dc; join with a sl st in top of ch 3, break yarn. Round 20: Turn bag to work from WS, in opposite direction of last row. With Color A, join to top of ch-3 that began previous round with a sl st, ch 5 (as dc and ch 2), skip ch-12 sp, *dc in the next st, skip 2 sts, [(2 dc, ch 1, 2 dc) in next st, skip 3 sts, (dc, ch 1, dc) in next st, dc2tog in between the posts on either side of the dc2tog of the previous round, (dc, ch 1, dc) in next st, skip 3 sts] twice, (2 dc, ch 1, 2 dc) in the next st, skip 2 sts, dc in the next st, ch 2, skip ch-12 sp, dc in the next st, skip 2 sts, [(2 dc, ch 1, 2 dc) in next st, skip 3 sts, (dc, ch 1, dc) in next st, dc2tog in between the posts on either side of the dc2tog of the previous round, (dc, ch 1, dc) in next st, skip 3 sts] 3 times, (2 dc, ch 1, 2 dc) in the next st, skip 2 sts,** dc in the next st, ch 2, skip ch-12 sp; repeat from * to **; join with a sl st in 3rd ch of ch 5, break yarn. Round 21: Turn bag to work from RS again. With Color B, join with a sl st to the top of the ch-3 that began previous round, as you look at the RS of the bag (see diagram above). Ch 3 (as dc), *skip 2 sts, [(2 dc, ch 1, 2 dc) in next st, skip 3 sts, (dc, ch 1, dc) in next st, dc2tog in between the posts on either side of the dc2tog of the previous round, (dc, ch 1, dc) in next st, skip 3 sts] 3 times, (2 dc, ch 1, 2 dc) in the next st, skip 2 sts, dc in the next st, ch 12, skip ch-2 sp, dc in the next st, skip 2 sts, [(2 dc, ch 1, 2 dc) in next st, skip 3 sts, (dc, ch 1, dc) in next st, dc2tog in between the posts on either side of the dc2tog of the previous round, (dc, ch 1, dc) in next st, skip 3 sts] twice, (2 dc, ch 1, 2 dc) in the next st, skip 2 sts, dc in the next st, ch 12, skip ch-2 sp, dc in the next st; repeat from *, omitting last dc; join with a sl st in top of ch 3, break yarn. Round 22 – 38: Repeat Rounds 20 – 21, ending with a Round 20 row. ROPE ASSEMBLY TIME! Lace up the ch-12 loops as shown above. In words: Pull each ch-12 loop underneath the ch-2 loop below it, pulling toward the RS (outside) of the bag. Pull each ch -12 loop through the ch-12 loop below it, moving on up the bag. At the top of each loopy section, use a stitch marker or scrap yarn to hold the last ch-12 loop up with the last ch-2 loop. When all 4 loop sections are complete, move to Round 39. Round 43: With Color B, (join anywhere) ch 1, sc around inside of handle opening, using seamless join to finish off. Round 44: With Color A, (join anywhere) ch 1, sc around outside/top of handles and bag opening; join with a sl st in 1st sc, do NOT turn. Round 45: Sl st in each st around; break yarn and use seamless join to finish off. OPTIONAL: Add rows of surface crochet to the handles and top, as shown in the photo above. I used Color B, but Color A would make great stripes if you prefer! Whew! That might look intimidating (and it was a bear to write it out!) but making it was so fun, I had to share it! Watching the tutorials will help you get an overview for how this bag comes together – and take the long lines of instruction one row at a time. I’d bet that once you get started with each round, and see how they go, you’ll be flying along in no time! I hope you enjoy making it as much as I did – and get a chance to take it somewhere fun soon! Written pattern and photos copyright Tamara Kelly 2014. You are welcome to make finished items from this pattern to sell – see the About page for details. To print this pattern for personal use, please use the Print Friendly button below – there’s a tutorial HERE if you need help. 😀 Thank you so much Mindi! 😀 Thank you so much Carrie! 😀 I think it would work with any yarn! I like cotton for totes, but that’s just personal preference. No reason acrylic wouldn’t be fine! Day at the Beach Bag! Heck I’m going to make it carry my crochet projects, btw I live in Colorado! Beautifully written patterns! When you showed the wobbly stitch a few months age I was really intimidated, but when I saw this bag I knew I had to overcome! With the help of your tutorials I came, I saw, I croched! Thanks so much! Hi there! I am so excited to be making this bag! I have started, but I am stuck at Round 20 – I am hoping you can help. 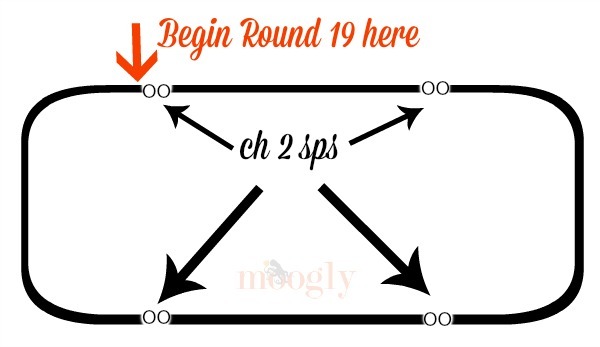 I am confused about starting Round 20, as I ended Round 19 with the ch12, sk ch2 space, slip stitch to join and Round 20 is supposed to be working in the opposite direction of Round 19. I’m not sure if I have misunderstood something but in Round 20 I will run into the ch12 almost immediately, so I’m not sure what to do since the directions don’t say to skip that ch12 until further into the round. I must be doing something wrong but can’t figure it out, hope this makes sense! I appreciate any help you can offer! Hi Christina! I’m sorry for the confusion, I see what you mean. Yes, you ch 5 (as a dc and ch 2) and skip over the ch-12 loop, putting the first “real” dc in the dc on the opposite side of it there. I’ve edited the pattern to reflect that. You were right! 🙂 Thanks for letting me know! Thank you so very much for your help, can’t wait to finish it now! This bag looks awesome…however, I am stuck on row 19, when I get to the part that says ch 12 and skip ch 2 spot, I am nowhere near the ch 2 spot, is it supposed to be like that? Hi Jennifer, and thanks! 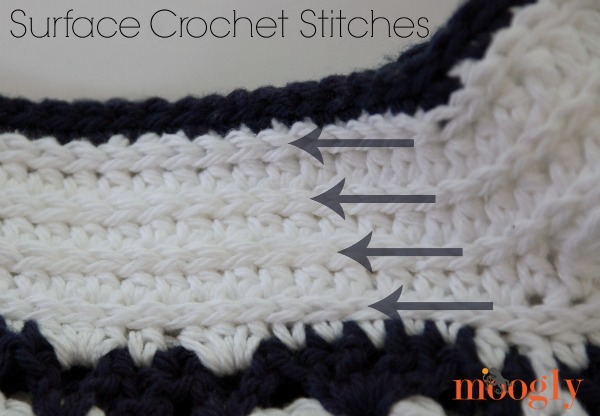 😀 It sounds like you missed some stitches somewhere – when you ch 12 you should have just crocheted into the stitch right before the ch-2 of the previous round. Did you repeat the part in the brackets 3 times? Hi Tamara, I just finished crocheting this bag and it’s lovely however I know it needs blocking of some sort because the handles are a bit wonky. Could you share how you blocked your bag. Thanks so much for the pattern, I’m looking forward to using it on our beach trip in a couple of weeks. ?